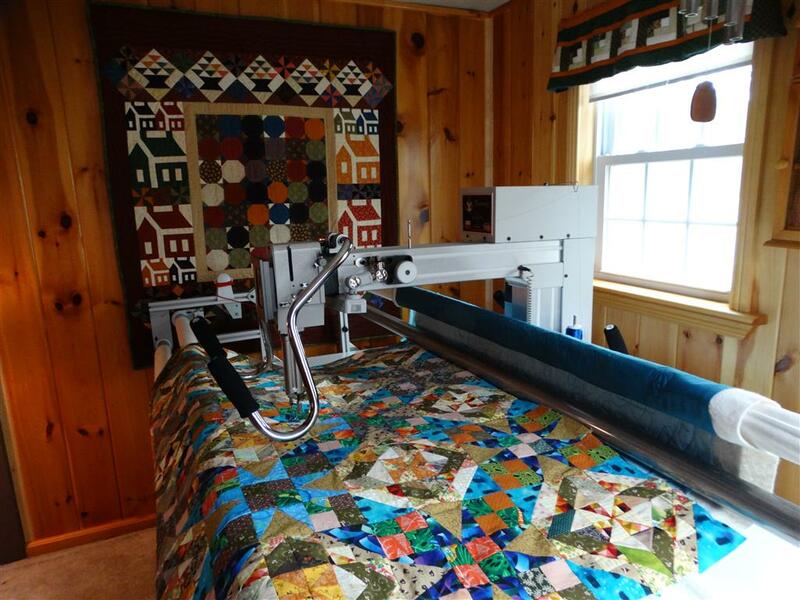 What kind of machine do you use and what is the largest quilt can you longarm? All my longarm quilting is completed on my ABM Innova 22” Longarm machine. I have a 10 foot frame and can accommodate a quilt up to 110 inches wide and any size length you need. My cost is based on the size of your quilt and the complexity of the design treatment. Design time is Included in the cost. I design and hand sketch all of my longarm quilting designs from Freehand Edge to Edge treatments to Custom treatments. I am never far from my sketchbook. There is a $50.00 minimum quilting fee on Freehand Edge to Edge Quilting and Semi-Custom Quilting. There is a $75.00 minimum quilting fee on all Full Custom Quilting. This minimum fee is included in the cost of the Design Treatments provided that the total is above the minimum cost listed above. * Prices do not include batting and additional available services. Why do you offer batting when I can bring my own batting instead? I do not accept personal battings due to the differences in quality and performance. I have found my machine does not play nicely with some of the lower quality battings on the market today and using those sorts of battings is not the quality or professionalism I strive for in my quilting designs. I personally only use high-end quality battings for my own quilts and I would recommend no less for your special quilt. What is the difference between Free Hand, Pantographs and Computer Designs? My longarm quilting is 100% completely hand guided (freehand designs) by me and not done by an automated computer design system or by Pantographs. A pantograph is a paper pattern that is placed on the longarm machine table and then copied to the quilt by tracing the pattern using a laser pointer as a guide. Due to my freehand designs, there will always be that homemade feel and personal one of a kind touch for your quilt. What should I consider while deciding the appropriate design for my quilt? What is my budget? Do I have a set price range I am looking for and am comfortable with? This is a very important decision to make ahead of time, before deciding which design treatment and additional services is right for your quilt. What is my time frame? When do I need this quilt finished by? A few weeks from now, or maybe a couple months from now. For Example: Choosing a freehand edge to edge design will have a faster turnaround time then a semi-custom or a custom design treatment. What kind of themes do I like? What themes do I not care for? For example, do I like swirls, feathers, or maybe leaves, but maybe not Modern themes such as straight lines or etc. How is my quilt going to be used and cared for? Will my quilt be well-loved, washed often, put away, and/or hung? Is it for a Baby Shower, a Graduation Present, Wedding Gift, an Anniversary Present, Picnic Quilt, Wall Hanging, Heirloom Quilt, Show Quilt?) When deciding a design treatment knowing your quilt’s purpose will help you decide on the appropriate treatments. Do I like to bind my own quilt or would it be easier for me to have this service done partially by machine or completely done? This is a part of the quilt making process that you either love to do, dislike it, maybe run out of time and patients to complete. Do you offer binding services? What size do I need for my backing fabric? Please cut your backing 8 inches larger than your quilt top on all sides. This is very important and leaves enough extra fabric on all sides to be loaded onto my Longarm and secured tightly on all sides for precise quilting. Can I ship my quilt to you for services? If you live within the United States, I am glad to offer my longarming services to you. Many of my customers do not live in or near Londonderry, New Hampshire. That’s ok! I would be glad to give you a complimentary design treatment consultation by e-mail or phone while I wait for your quilt by mail. I do ask that you please fill out the Quilt Request Form prior to our appointment. Do I need to make an appointment with you if I’m local to Londonderry, NH? Yes, please email or call me if you are local to the Londonderry, New Hampshire area. Quilt drop off and pick up are by appointment only. At your appointment I will go over my longarm services with you in a complimentary design treatment consultation. We will go over the best design options for your quilt and I will be able to give you a better estimate of the timing of your finished quilt and a more accurate estimate of charges for your quilt and services. Can I watch you quilt my quilt? Unfortunately no, I do not allow customers to be in my studio while I’m quilting. Your quilt is very special to me and I want to be able to put all of my focus and attention into your quilt when it is on the frame of my longarm. I also quilt at my longarm at various times throughout the day and this would be difficult to schedule. How long will it take to quilt my quilt? My turn around time after receiving your quilt is approximately two weeks on free hand edge to edge designs; custom quilts can have an extended time approximately three – five weeks. Additional services such as binding may add a couple extra days. Express services can be applied under special circumstances.